For small jobs, a backhoe attachment for a compact tractor can handle light excavation to transplanting trees to stump removal. Start with your tractor’s power. The most critical assessment to make for your compact tractor regarding power is to compare gross horsepower and PTO horsepower. PTO horsepower and engine torque are often not advertised, so be sure to talk to your tractor dealer. Another important aspect of comfort and ease of use is visibility, and boom design has a great affect on this. Straight boom designs have been proven to be useful and reliable; however, the more innovative curved boom design allows for greater visibility to the operator, higher strength and increased digging depth. Give both options a try and see what feels best for your unique needs and comfort level. Finally, the last consideration to make when purchasing a backhoe attachment is the function and storage of the attachment. 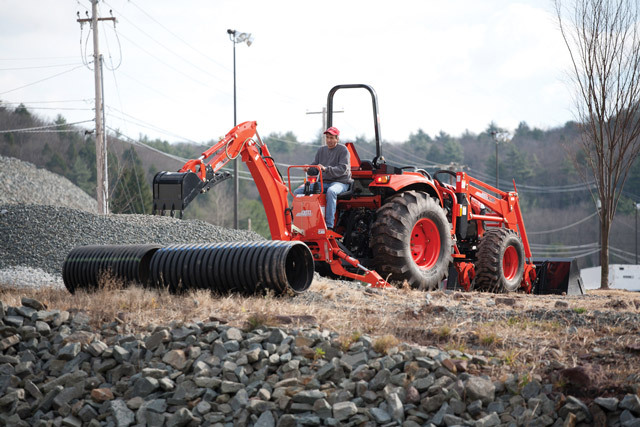 Backhoe attachments come in two options — a removable sub-frame design or a four-point mount system. The sub-frame design requires that you remove the entire sub-frame and a long ladder bar-framed section when not using the attachment. While the process is relatively simple, it requires a large amount of storage space. The four-point mount system allows removal of the backhoe alone, making removal quick and easy and reducing the amount of storage space needed.